The guide will explain how to easily create your Windows Mobile ringtone from any video/audio files. Firstly, download, install and launch the software. Then, the main interface pops up. 2. Click "Play" button to hear the music before creating ringtone and find the part you want to use. Then drag and drop the start & end slider to get music clip to convert, or type the start & end time in the corresponding text box directly. 4. If you want, check "Export to Phone" option to let the program upload the output ringtone to your Windows Mobile directly after conversion. 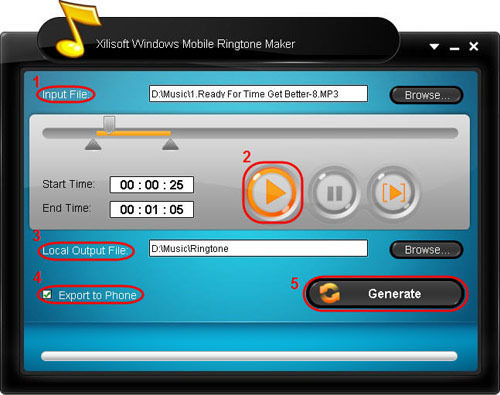 Just in a few minutes, you make your own Windows Mobile ringtone from the loved music.